Los Angeles county and the city of Los Angeles share the largest homeless population in the United States of America. The U.S. Department of Housing and Urban Development reported in 2017 that both the city and county experienced a 26% increase in homeless residents. California State University, Northridge journalism professor David Blumenkrantz documents the stories of the city’s homeless in an art exhibition, titled “Street Scenes: Making the Homeless Count,” on display at the San Fernando Valley Arts and Cultural Center (SFVACC), in Tarzana, until Jan. 27. 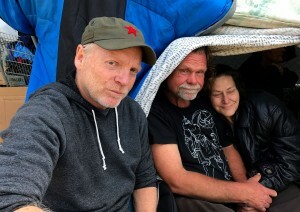 CSUN journalism professor David Blumenkrantz, with an unnamed homeless couple in North Hills. Photo courtesy of David Blumenkrantz. Using his more than 20 years of experience as an educator and advocate on behalf of marginalized populations, the CSUN alumnus is extending his expertise as a documentary photographer beyond the classroom and into the community through a grant provided by the university’s research and grants committee, enhancing both the public’s education and awareness of this humanitarian crisis. One of Blumenkrantz’s many photos on exhibit at the San Fernando Valley Arts and Cultural Center. “During the course of this project I visited and conducted interviews and portrait sessions at several organizations, including MEND Poverty in San Fernando, North Valley Caring Services in North Hills and St. Charles Borromeo Church in North Hollywood,” Blumenkrantz said. 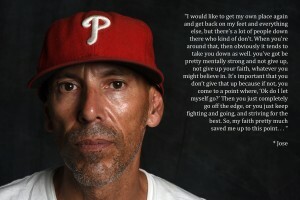 “This work was made possible in large part by a Research, Scholarship and Creative Activity (RSCA) grant from the university, allowing me to continue my work both as an independent artist and as an educator, documenting and advocating on behalf of the homeless,” he added. The SFVACC created the art exhibit last year in conjunction with the annual homeless count, recognizing the homeless population in the San Fernando Valley. This year is the center’s second annual exhibit with photography and art that depict people living on the streets along with their stories. The art display is free and open to the public. A photo by Blumenkrantz on exhibit at the San Fernando Valley Arts and Cultural Center. For more information on the exhibition, visit www.sfvacc.org. Photographs by Blumenkrantz may also be viewed online at www.david-blumenkrantz.squarespace.com.